What a convenience to walk directly off your patio to the pool deck and beach boardwalk. 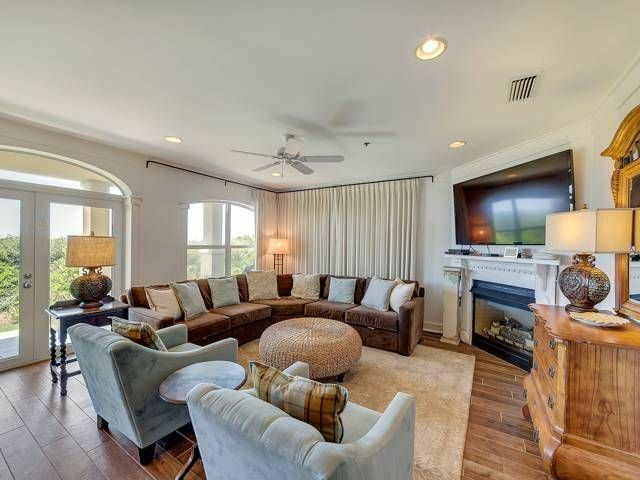 Enjoy the open living space after a day in the sun. Make this condo your choice for that special family getaway also large enough for 2 small families to share with 2 king bedrooms with private bathrooms & 2 full beds in the third bedroom. Beyond the palm tree lined gated community there is a wealth of fun & exciting activities all up and down scenic highway 30A. So… don't miss out book today. My family and I (which included 2 grandchildren under the age of 4) loved the condo. Plenty of room and proximity to the beach and pool was great. When I reserved this condo I read over all the rules and regulations and there was never any mention of not allowing a tent on the beach. We try to set up tent on beach and was told we could not. Having small children that was a must. Second the security at this facility was beyond rude. The pool attendant (who is there all day) saw us for two days and knew we had all the appropriate identification to be at the pool. The security guard came in one afternoon into the pool area and starting yelling at us that we need to have our yellow pool bands on at all time. Completely unnecessary. Would not recommend this facility to any friends or family. Gazell C.Where do you live? We had an amazing week-long vacation at this condo . We were a family of two with four girls under the age of four, and we couldn't have asked for a better place to accommodate our families. There's a grassy area just outside of the patio so the kids could play, and the pool and beach boardwalk were right next to the unit. The kitchen is complete, and there was even a blender and crockpot. The furniture was new and the colors/artwork were beautiful and really added a nice touch to the condo. This place is also walking distance to a shopping area with FroYo, candy shop, coffee shop, bike rental facility, and a Mexican restaurant. Rosemary Beach is also of walking distance. Thanks so much to the owners for letting us rent their home-away-from-home, and we hope to stay at their wonderful place again!